S-K is a well-known maker of automotive hand tools with roots (as a division of the Sherman-Klove Company) going back to the 1920s or before. This page will look at a distinctive style of knurled-base sockets produced by S-K from the 1930s through 1960s. 06/16/2007: Added a Artisan 4270 1/2-Drive Ratchet. 06/05/2006: Reworked discussion of ratchets and added a 42470 Ratchet. 05/19/2006: Added a 47170 3/4-Drive Ratchet. 01/26/2006: Added indexing tags for the new Site Index. 01/12/2006: Added a Craftsman 3/4-Drive Socket. 12/17/2005: Added a Model 45170 Ratchet. 11/24/2005: Added a Model 42470 Forged-Handle Ratchet. 11/20/2005: Updates to text; added a Model 40809 Draglink; updated navigational links. 11/06/2005: Added photos of sockets with drive-end recesses. 10/30/2005: First release, still missing some photos. The page will look at the early history of S-K Tools, with an emphasis on the distinctive knurled-base sockets developed in the mid 1930s. For a more general look at the history and development of the company, please see our article on Sherman-Klove and S-K Tools. The S-K history begins with the founding of the Sherman-Klove Company in Chicago sometime before 1918. Sherman-Klove specialized in screw-machine products, and in the 1920s produced sockets and other turned products for the fast-growing automotive tools market. During the 1920s Sherman-Klove appears to have operated primarily as a contract manufacturer for other companies, and may have been responsible for much (if not most) of the screw-machine socket production marketed by a number of companies. The 1930 Donnelley's Industrial Directory listed the Sherman-Klove Company under the category "Screw Machine Products", and gave their address as 3531 W. 47th in Chicago. In the 1940s S-K formed an alliance with another tool company, the Lectrolite Corporation of Defiance, Ohio, and the two brands were advertised together as S-K/Lectrolite. (It's unclear as to whether this was a formal merger of the companies or more of a cooperative marketing agreement.) Lectrolite had more experience in wrench forgings and handled this side of the business, while S-K concentrated on sockets and drive tools. In 1962 S-K and Lectrolite were purchased by the Symington-Wayne Corporation, and the tools began to be marked with the "S-K Wayne" trademark by 1964. A few years later, Symington-Wayne was purchased by Dresser Industries, a large conglomerate, and S-K Tools became a division of Dresser. Fig. 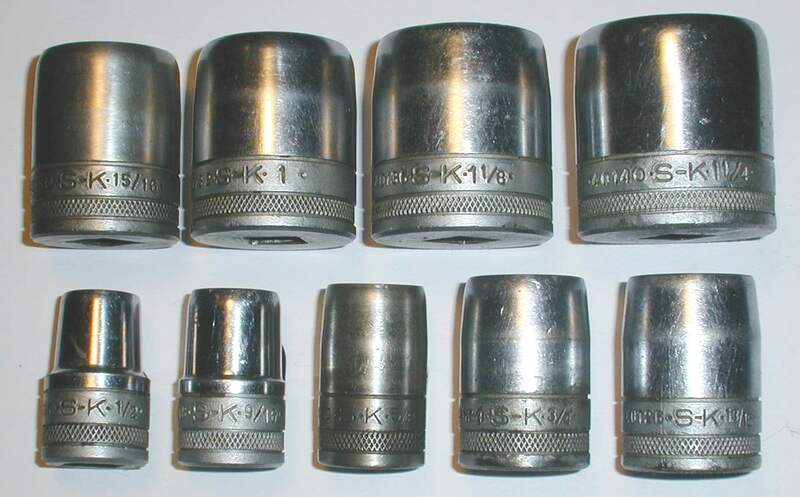 1 shows a group of the earliest generation of 1/2-drive knurled-base sockets, marked "S-K Chrome" and with the fractional sizes, but without model numbers. The socket sizes are, from the left, 7/16, 1/2, 21/32, 11/16, 3/4, and 1-3/16. Fig. 1. 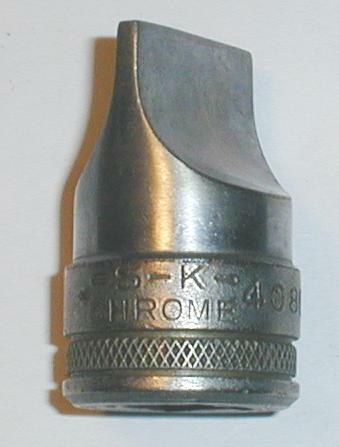 First Generation of 1/2-Drive Knurled-Base Sockets, Marked "S-K Chrome", From 1933. Fig. 2. Second Generation 1/2-Drive Knurled-Base Draglink Driver, Marked "S-K Chrome 40809", From 1939. No standard sockets of this generation have been found thus far, suggesting that the production of this generation may have been of short duration. However, another member of this tool family, a model 40809 draglink driver, is shown in Fig. 2 at the left. The next change to the socket series was a minor cosmetic update, the replacement of the "S-K Chrome" logo with a simple "S-K". The sizes and model numbers continued to be marked as well. Fig. 3. Third Generation 1/2-Drive Knurled-Base Sockets, Marked "S-K" with Model Numbers, From 1944. Fig. 3 shows a partial set of these sockets, with the model numbers (mostly) visible on the larger sockets. The bottom row sizes are, left to right, 9/16, 19/32, 5/8, 11/16, 25/32, 13/16, and 7/8, and the top row sizes are 15/16, 31/32, 1", 1-1/16, and 1-1/8. Note that the above sockets include three of the less common sizes, 19/32, 25/32, and 31/32; a fourth size, 21/32, may have been available at this time as well. According to the S-K catalogs, the availability of certain sizes changed over the years. For example, the 1939 catalog offered all of the 19/32, 21/32, 25/32, and 31/32 sizes, but a 1957 catalog shows that the 21/32 and 31/32 sizes had been discontinued by then. The approximate date for the change to the S-K logo can be inferred from the existence of certain unplated sockets bearing the new logo. Fig. 4 shows several knurled-base sockets marked with the new "S-K" logo, but with a plain steel finish instead of the expected polished chrome plating. Fig. 4. Knurled-Base Sockets With "S-K" Logo and Unplated Finish, ca. 1944-1945. Chrome finishes were known to have been discontinued during the 1944-1945 war years, due to government mandated rationing, so these unplated sockets were likely made during that time frame. This would place the transition to the S-K logo some time around 1944 or prior. For the next generation of knurled-base sockets, S-K made an improvement to retain the sockets more securely on the drive. This was done by the addition of recessed grooves to the socket drive end, in line with the common practice of the industry. A brief background of the drive end recesses may be helpful here. However, as manufacturing processes were improved, various makers started adding drive-end recesses. To my knowledge, the earliest examples date to the early 1930s on the 1/2-drive deep sockets made by New Britain; these were sold under their own brands and as the Craftsman "BE" line. Deep sockets made by Williams in the 1930s (e.g. model SD-1228) also have drive-end recesses. Duro/Indestro appears to have begun adding the drive recesses to their sockets by 1944, based on the likely dates of the "D-I" sockets. (See our article Duro and Indestro Tool Identification for more information.) Snap-On introduced the drive-end recesses around 1950, replacing their older practice of drilling a hole in one drive wall. At some point S-K began adding the drive end recesses as well, though I've been unable to pinpoint the exact date. However, it's probably reasonable to assume that the drive recesses occurred before 1955 or so. Fig. 5. Fourth Generation Knurled-Base Sockets With Drive Recesses, From 1955 (?). Fig. 5 shows a selection of the fourth-generation knurled-base sockets with the drive recesses. The sizes are, from the left in the bottom row, 1/2, 9/16, 5/8, 3/4, and 13/16; in the top row, 15/16, 1", 1-1/8, and 1-1/4. All of these are 12-point sockets. One other minor change to the socket specifications occurred during this period. In 1958 S-K changed the broaching for the three smallest 1/2-drive sizes, 7/16, 1/2, and 9/16, from 12-point to 6-point. The model numbers weren't updated for this change, so for example a 40114 socket could have either 12-point or 6-point broaching, depending on when it was made. The date for this change was determined by consulting catalogs; an S-K/Lectrolite booklet from 1957 lists 12-point sockets in those sizes, but a 1958 catalog shows them in 6-point. Fig. 6 shows a somewhat odd photograph of the drive end of a socket, with back lighting to illuminate the oval-shaped drive recess. All four of the drive walls have such a recess. Fig. 6. Close-Up of Socket Showing Drive End Recess. The last generation of the knurled-base series was introduced in 1964 with the change to the S-K Wayne brand. The Symington-Wayne corporation had purchased S-K Tools in 1962, and in 1964 registered the S-K Wayne trademark and began using it on the tools. The knurled-base sockets were discontinued shortly after this, and were replaced by a new design with hot-broached construction and a fully polished finish. Fig. 7. 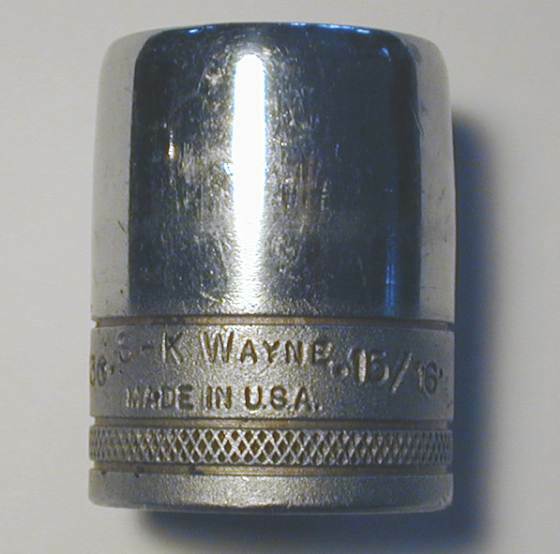 Final Generation of Knurled-Base Sockets With "S-K Wayne" Logo, ca. 1964. 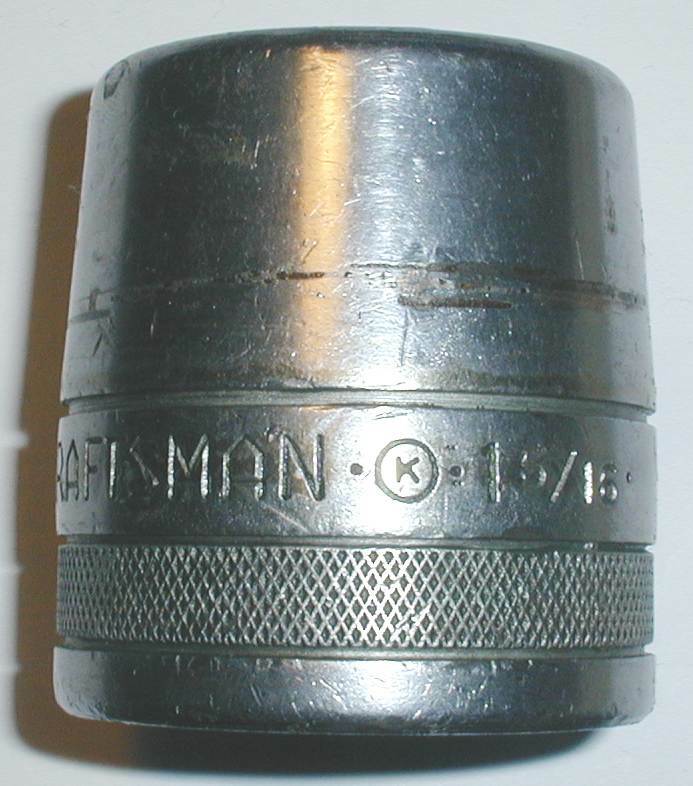 However, at least some of the older-style sockets were made with the S-K Wayne logo, as can be seen from the example in Fig. 7 at the left. The S-K Wayne marking on the tools was relatively short-lived, as a 1969 catalog issued by Dresser shows the use of the mark "S-K Tools". This allows us to estimate the manufacturing date for the S-K Wayne mark as 1964-1968. The knurled-base socket design was also used for 1/2-drive deep sockets, as seen in Fig. 8 below. This set includes sizes 9/16, 5/8, 11/16, 3/4, 13/16, 7/8, 15/16, 1, and 1-1/8 inches. Based on a faded sticker, the set appears to be an S-K model 4810; the 1939 catalog shows a very similar model 4808 set of deep sockets, but having one less socket. Fig. 8. S-K Model 4810 Deep Socket Set, Knurled-Base with Cross-Bar Hole and Handle, ca. 1946-1955. At the time, deep sockets were intended mostly for spark-plug removal and were usually provided with a hole for use with a cross-bar. The 1/2-drive deep sockets probably went through the same generational changes as the shallow sockets; in particular, later versions of the deep sockets dropped the cross-bar hole and added drive-end recesses. Although the relative timing of these changes is not known, the 1957 catalog shows that the cross-bar holes had disappeared by that time. 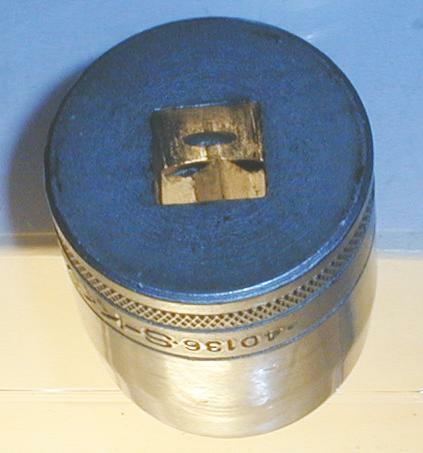 In addition to the 1/2-drive models shown above, the knurled-base design was also used for 1/4-drive and 3/4-drive sockets. As the appearance is similar to the 1/2-drive sockets, no photographs need to be shown here. S-K also produced 3/8-drive sockets, but oddly enough, the knurled-base design was apparently never used for this drive size. Even a relatively early catalog from 1939 shows that 3/8-drive sockets were available only in a fully-polished form. One interesting side note is that the S-K 3/4-drive sockets (and drive tools) were selected by Sears for their Craftsman line, and were offered in the Craftsman catalogs at least as early as 1938. The identification of S-K as the manufacturer was made by the close resemblance of the ratchet and sockets to the S-K models, and by examination of the patent number (issued to S-K) in a photograph of a Craftsman 3/4-drive ratchet. (I don't have one of these in my collection yet.) These tools are marked with a manufacturing code consisting of a "K" with a circle around it. Fig. 9. Craftsman 3/4-Drive 1-5/16 Socket with Knurled Base, ca. 1935. Fig. 9 at the left shows an example of the Craftsman 3/4-drive sockets made by S-K. The close similarity to the 1/2-drive knurled sockets is apparent from the photograph, and the socket construction matches as well. This particular socket is marked with the original Craftsman block logo, suggesting a manufacturing date in the early to mid 1930s. Note the K-Circle manufacturer code used to identify S-K production. No discussion of sockets would be complete without some mention of the corresponding drive tools, so we'll present some examples of such tools. Our selection will focus on the fine-tooth ratchets developed by S-K in the early 1930s, as these are among their most notable products. Our first example will show one of the earliest fine-tooth ratchets produced by S-K, marked with the first of a number of their patents on ratchet mechanisms. Fig. 10 below shows a 1/2-drive model 4270 ratchet, marked "Chrome Alloy" and with "Pat. No. 1981526". Although not marked with the S-K name, the ratchet can be readily identified as S-K production by the patent #1,981,526, assigned to the Sherman-Klove Company. In addition, the distinctive forged handle is identical to the later S-K Model 42470 Ratchet shown below. The overall length is 10.2 inches. Fig. 10. S-K Model 4270 1/2-Drive Forged-Handle Ratchet, with Inset for Reverse, ca. 1934-1938. S-K's tool engineer T. Rueb went on to make a number of improvements to this basic design, and eventually received at least seven ratchet-related patents for S-K; clearly the company had made ratchet development a priority during this period! Most of the ratchets of this model (and other drive sizes) found today will be marked with the later patent #2,232,477 issued in 1941; see Fig. 11 below for an example. Fig. 11. S-K Model 42470 1/2-Drive Ratchet with Unusual Forged Handle, ca. 1941-1945. Fig. 11 shows an S-K model 42470 ratchet, marked with the S-K-Diamond logo and "Pat. No. 2232477" on a raised and polished panel. The forged body is hardened everywhere and is unplated, but with a polished head and panel. The overall length is 10.3 inches. The model 42470 ratchet was first introduced in the late 1930s and enjoyed a long and successful product life, with production continuing into the S-K Wayne period. The first ratchets were produced under patent #1,981,526 (see Fig. 10 above and Fig. 11 below), while later models used the improved mechanism in patent #2,232,477. This patent was issued in 1941 to T. Rueb and assigned to Sherman-Klove. Our next figure shows one more example of the S-K forged-handle ratchet, this time produced for the Artisan brand. Fig. 11B. Artisan Model 4270 1/2-Drive Forged-Handle Ratchet, with Insets for Side View and Reverse Detail, ca. 1940s. Fig. 11B shows a 1/2-drive Artisan 4270 ratchet with a forged handle, marked with the Artisan brand on the raised panel, and with the model number and "Pat. No. 2232477" on the reverse. As with the previous example, this ratchet can be readily identified as S-K production by the patent #2,232,477, assigned to the Sherman-Klove Company. In addition, the distinctive forged handle is identical to the later S-K Model 42470 Ratchet shown below. This ratchet was acquired as part of a 1/2-drive Artisan socket set of S-K production. Of the tools in the set, only the ratchet and the metal box were marked with the Artisan brand, with the breaker bar, extension, and sockets all bearing their normal S-K markings. Artisan was a brand name used by Gamble-Skogmo Inc., which operated a chain of Gamble Auto Supply stores and other retail outlets. Fig. 12. S-K Model 42470 1/2-Drive Ratchet. Fig. 12 puts us back on more familiar ground, showing another S-K model 42470 ratchet, but with the conventional knurled handle. The tool is marked with the S-K-Diamond logo and "Pat. No. 2232477", and the overall length is 10.2 inches. The fine-tooth ratchet mechanisms were also available in other drive sizes, as our next example illustrates. Fig. 13 shows a 3/8-drive S-K model 45170 ratchet, marked with the S-K-Diamond logo and "Pat. No. 1981526". The overall length is 7.5 inches. Fig. 13. S-K Model 45170 3/8-Drive Ratchet with Early Patent, ca. 1934-1939. For our final selection we offer an example of a 3/4-drive ratchet, the largest drive size made by S-K. Fig. 14 shows a 3/4-drive model 47170 ratchet, marked with the S-K-Diamond logo and a "Pat. Pend." notation. The overall length is 18.2 inches. Fig. 14. S-K Model 47170 3/4-Drive Ratchet, with Inset for Detail, ca. 1941-1942. These ratchets must have been a cause of great excitement when they were introduced in the mid 1930s, as other heavy-duty ratchets of the time had only very coarse actions. At least one major customer was very impressed: Sears Roebuck chose S-K to supply its Craftsman 3/4-drive tools and sockets, even after the contract for the other drive sizes had gone to New Britain Machine. The Craftsman catalogs show that S-K continued to supply the 3/4-drive tools at least until 1949. A prior figure shows an example of a Craftsman 3/4-Drive Socket with the "K-Circle" manufacturer's code. Information on the early history of the Sherman-Klove Company was found on the Berland's Tools website, a company with family connections to one of the founders of S-K. Product information was obtained from S-K catalogs dated 1939 and 1940, and from S-K/Lectrolite catalogs dated 1957, 1958, and 1963.